Back in February our church hosted a youth weekend activity called Disciple Now Weekend. Or, The WKND, as we called it. Saturday everyone was going to be hanging out at church for lunch. Pizza was on the menu. I got a call from one of the host home parents who works a lot with the youth wondering if I’d be interested in making dessert. 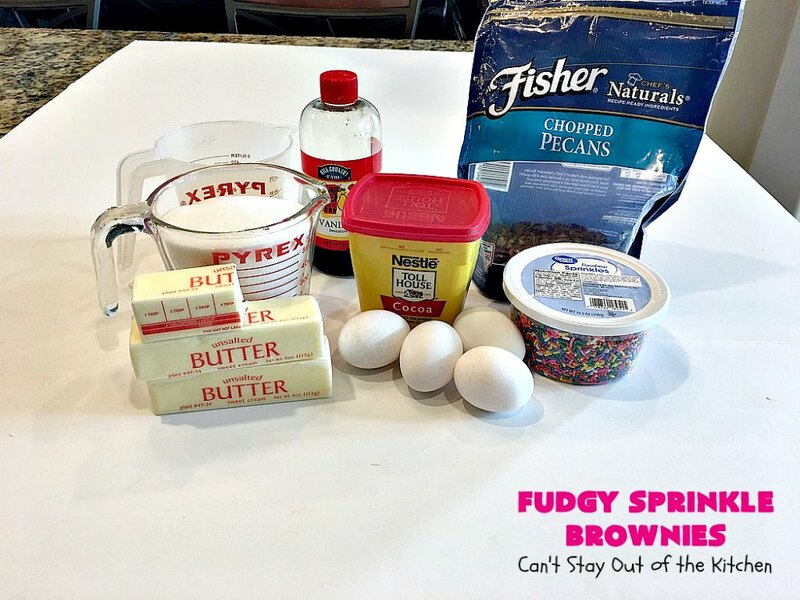 I’m always up for making dessert so I said YES! They needed dessert for 100. So I made four different kinds of brownies including my favorite Chocaroons, Sea Salt Caramel Chocolate Chunk Brownies and Coconut Pecan Pie Bars. 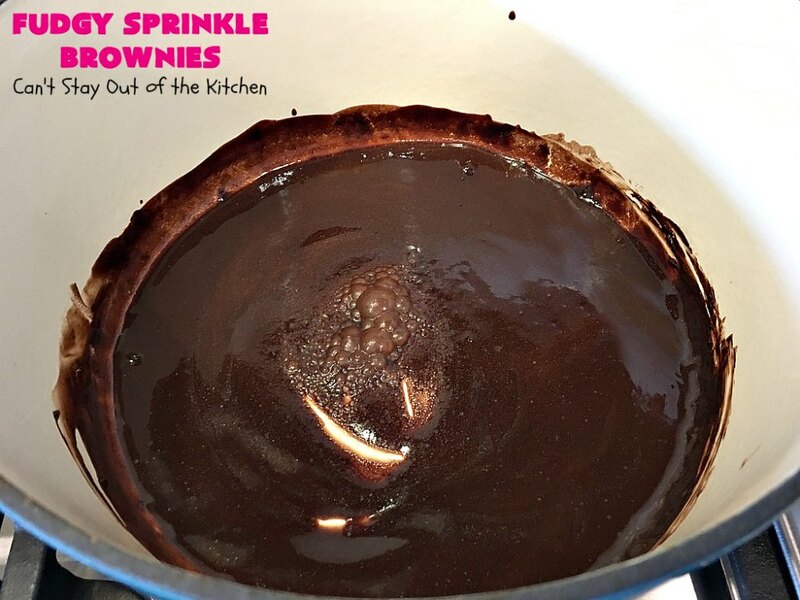 Since I made two batches of each recipe it was close to 200 pieces. 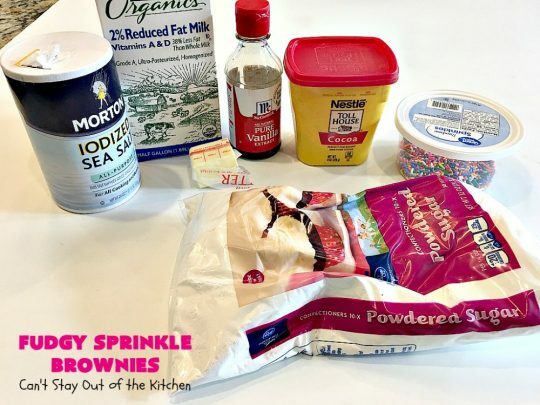 I wanted to use ingredients I had on hand. Plus, I was trying hard to use up about 10 bags of pecans and 4 large containers of sprinkles (left over from Christmas). This recipe allowed me to kill two birds with one stone. 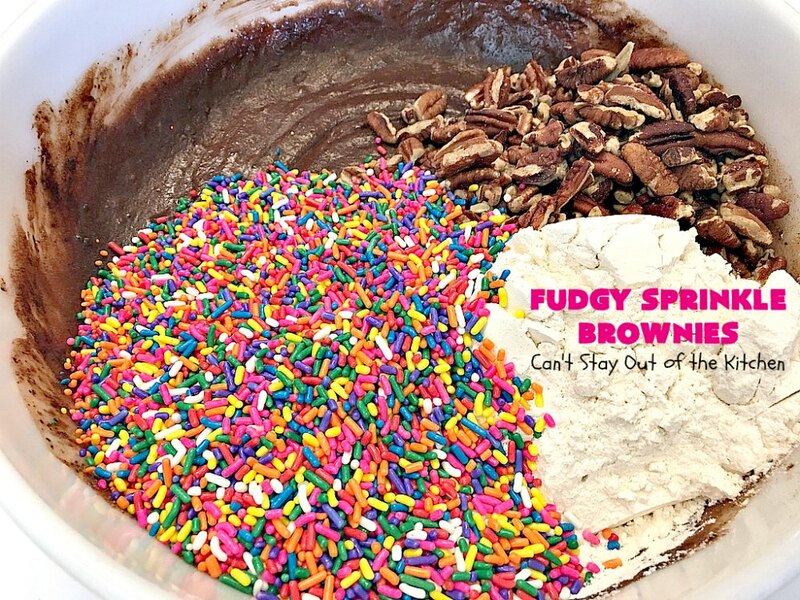 I used up a couple of containers on sprinkles and part of a bag of pecans. 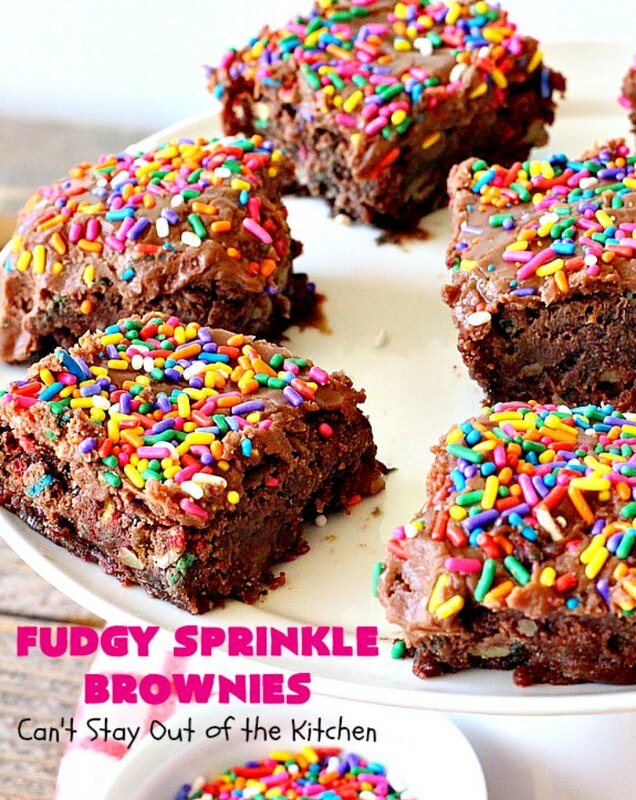 Fudgy Sprinkle Brownies are divine. If you need a chocolate fix, these brownies are sure to do it! 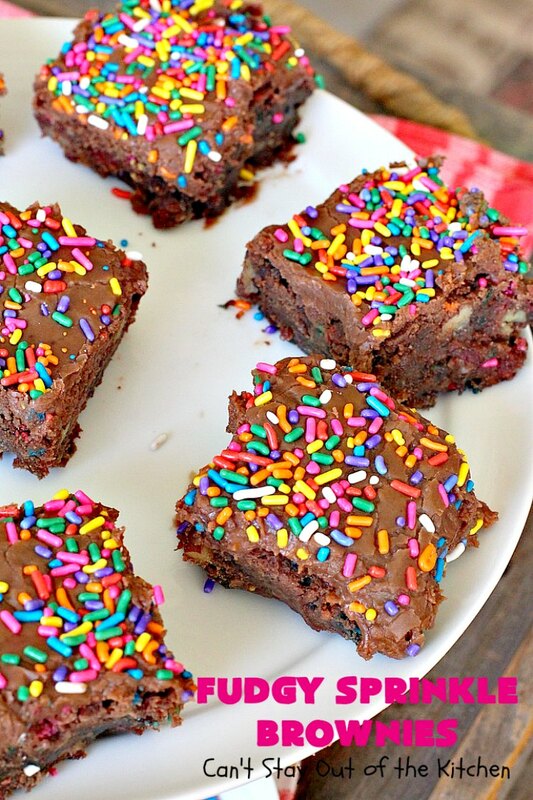 Fudgy Sprinkle Brownies are loaded with chocolate and have a fudgy sprinkle icing. I used these ingredients for the brownies. Add eggs, sugar, cocoa and vanilla. Combine with an electric mixer or whisk until smooth. 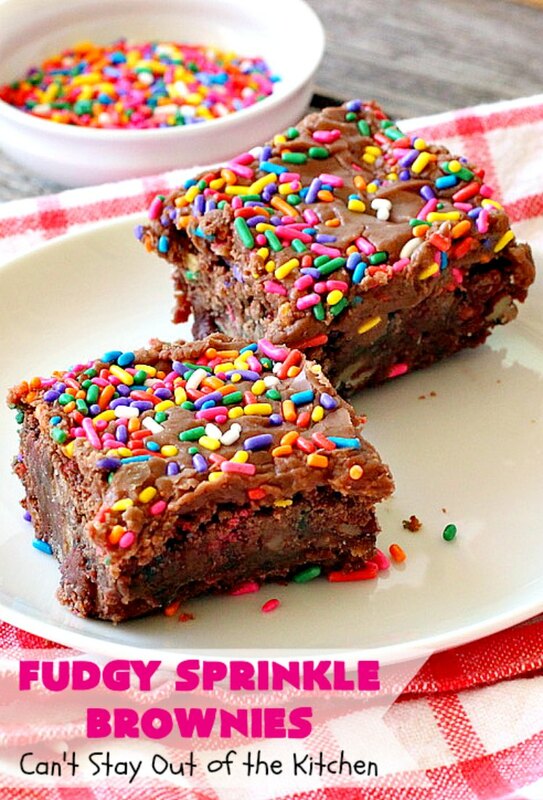 Add flour, pecans and sprinkles. 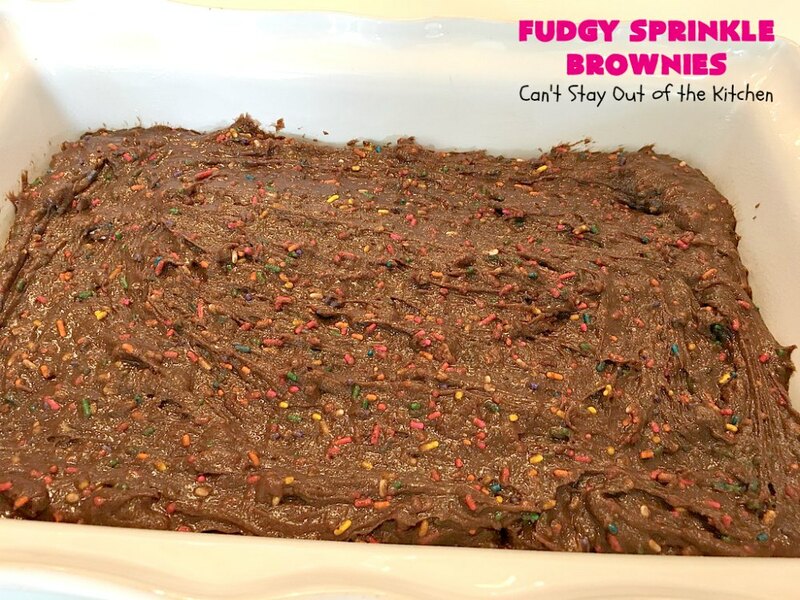 Spread into a greased 9×13″ glass baking dish. 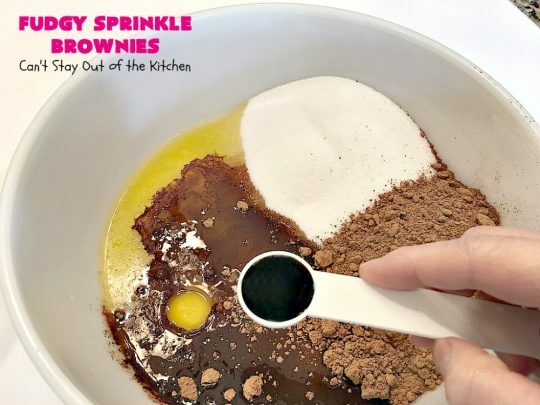 Bake at 350 for about 45-60 minutes or until a toothpick inserted in center comes out clean. 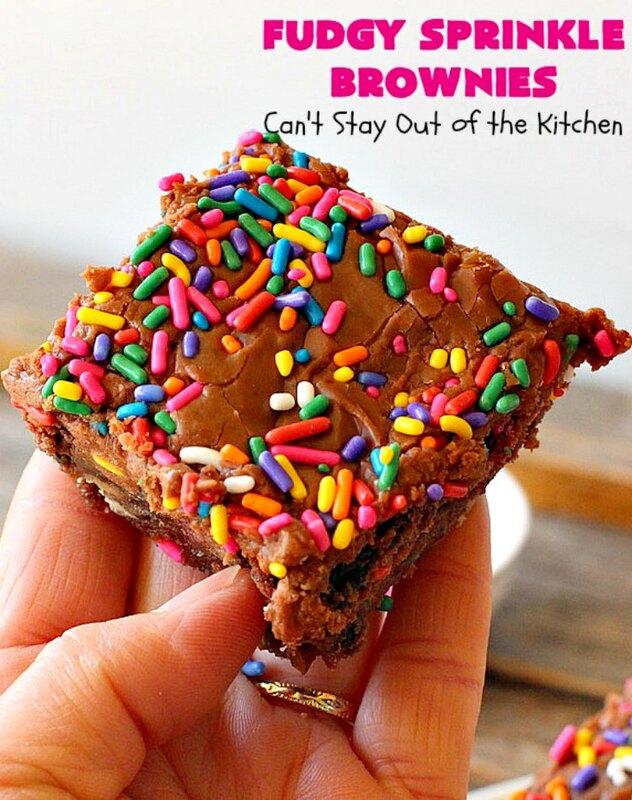 Allow brownies to cool completely before adding icing. 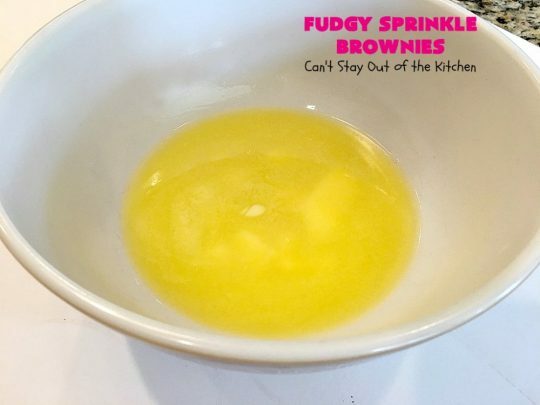 Melt butter over low heat in a medium-sized saucepan. Add cocoa and stir until smooth. Remove from heat. 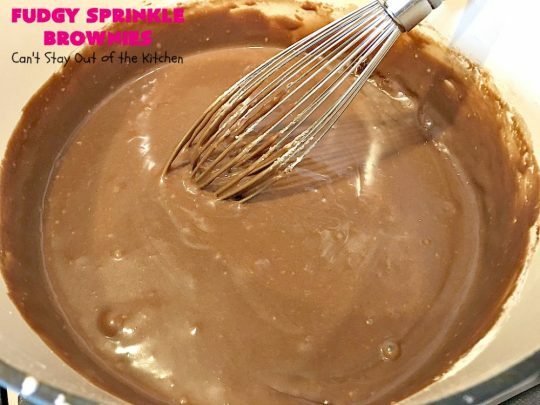 Add powdered sugar and milk and whisk until smooth. 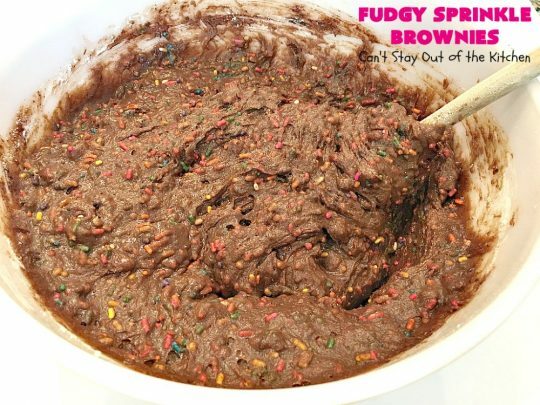 Spread icing over top of brownies very quickly or it will become unspreadable. 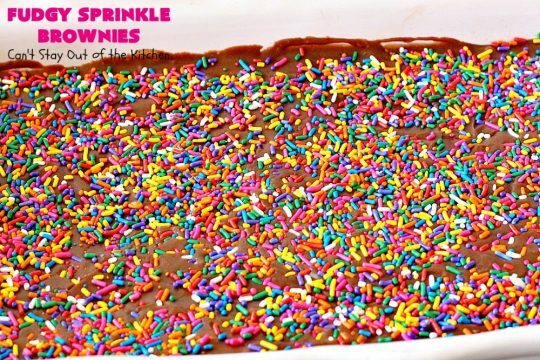 Sprinkle the sprinkles lavishly over the top. 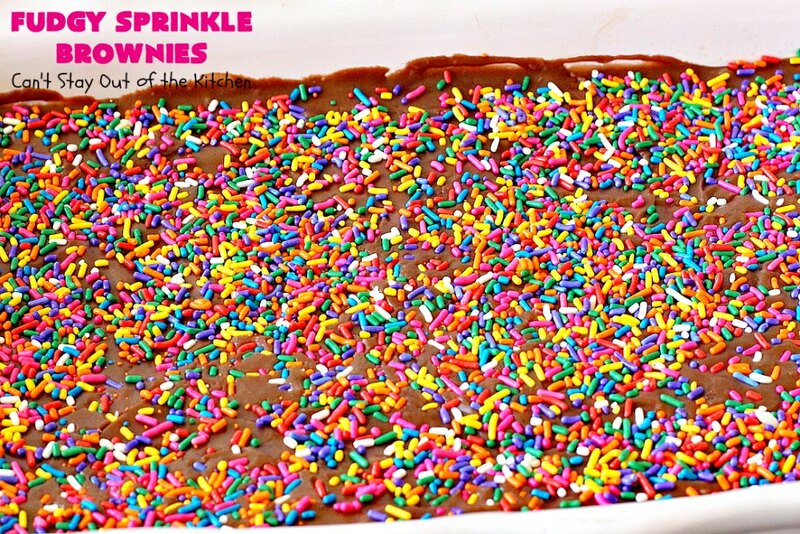 Press down very slightly so the sprinkles will adhere to the fudge frosting. Allow icing to set up about 30 minutes before serving. Fudgy Sprinkle Brownies are marvelous for tailgating parties or office parties. Every bite of these brownies will have you drooling! Fudgy Sprinkle Brownies are kid-friendly and will have you swooning! These fantastic brownies are filled with chocolate and sprinkles and are topped with a fudgy chocolate icing. These kid-friendly brownies are perfect for tailgating or office parties, potlucks or summer holiday fun. Melt 2 ½ sticks butter. Add cocoa, eggs and sugar and mix with an electric mixer or whisk. 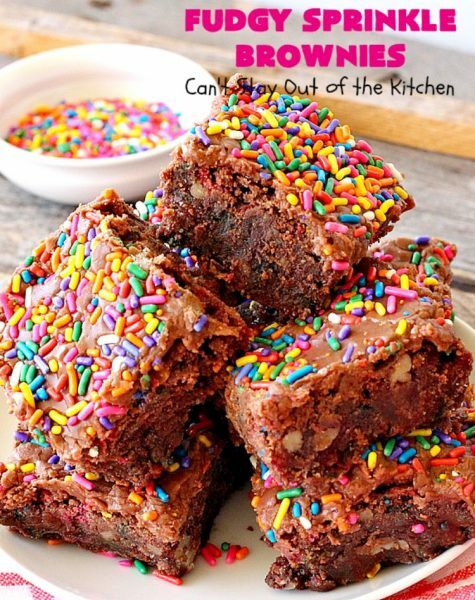 Stir in flour, sprinkles and nuts. Grease and flour a 9x13" baking dish. Bake at 350° for 45-55 minutes until toothpick inserted in center comes out clean. 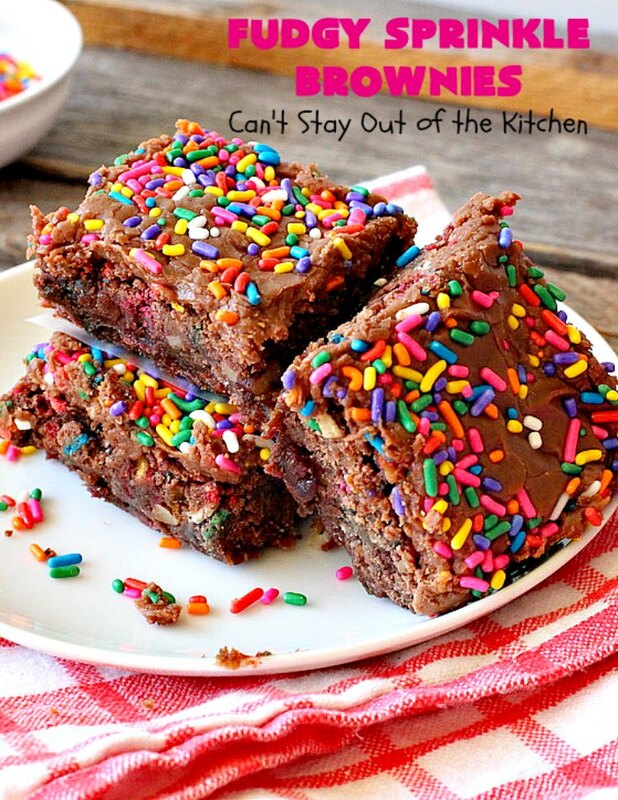 Allow brownies to cool about 30 minutes before adding icing. 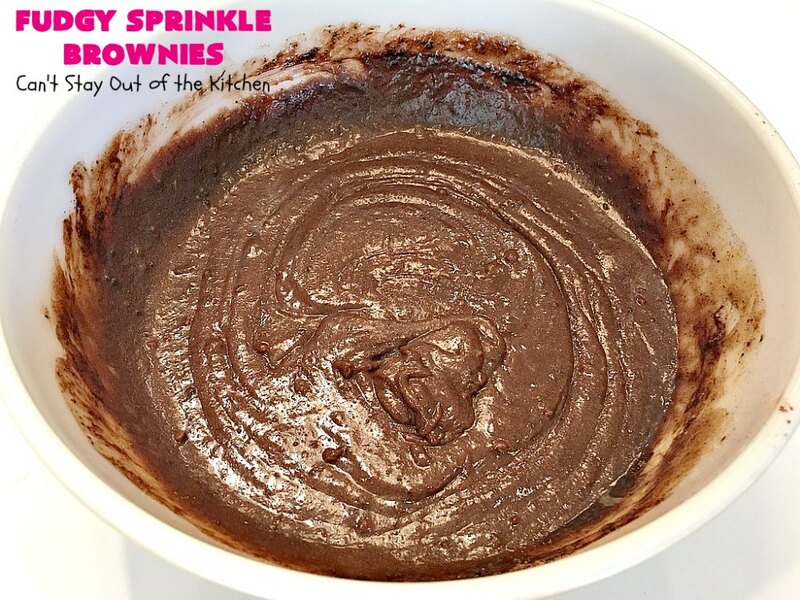 Cook butter and cocoa for 1-2 minutes on medium heat. 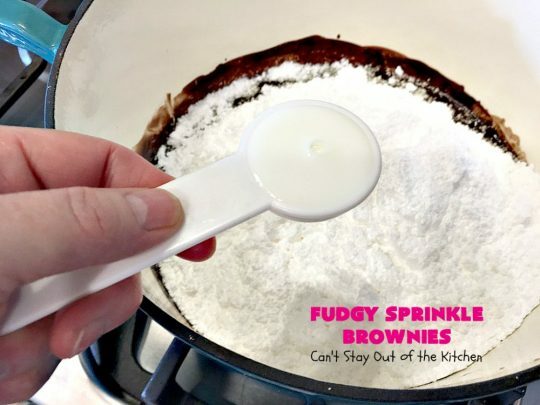 Add powdered sugar and milk and whisk to combine. Then add a dash of salt and vanilla. 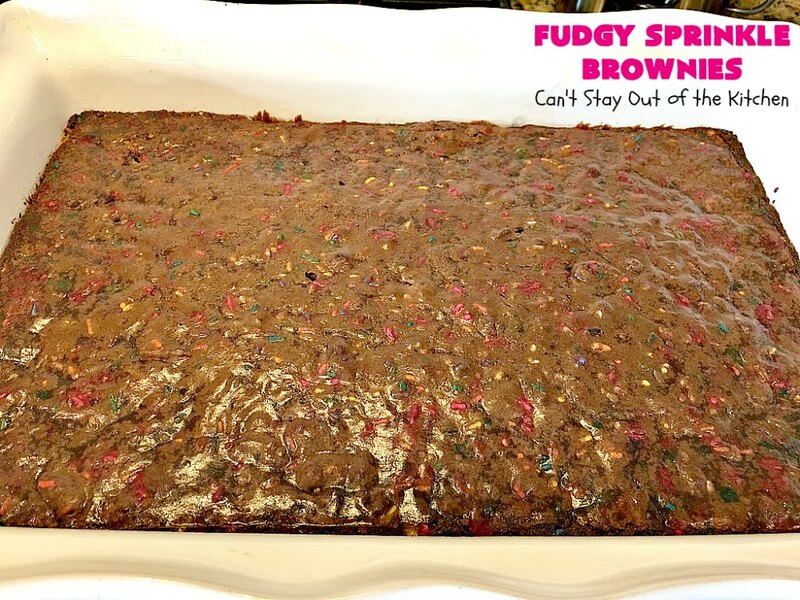 Spread fudge icing over brownies working quickly so frosting stays smooth. 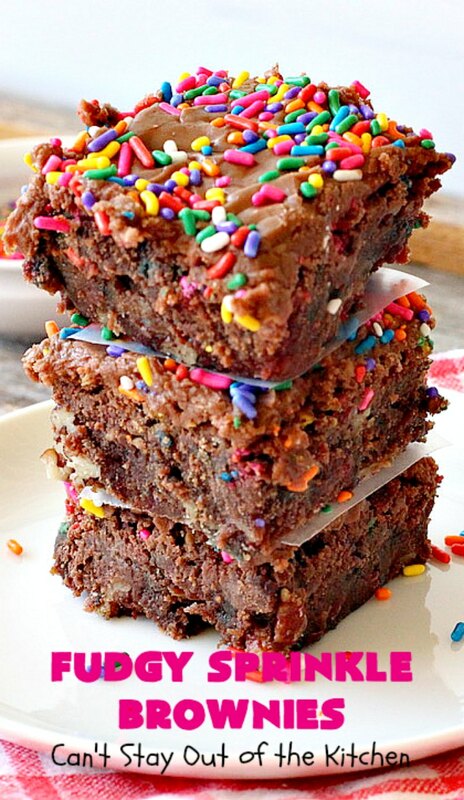 Allow brownies to set up before cutting into bars. 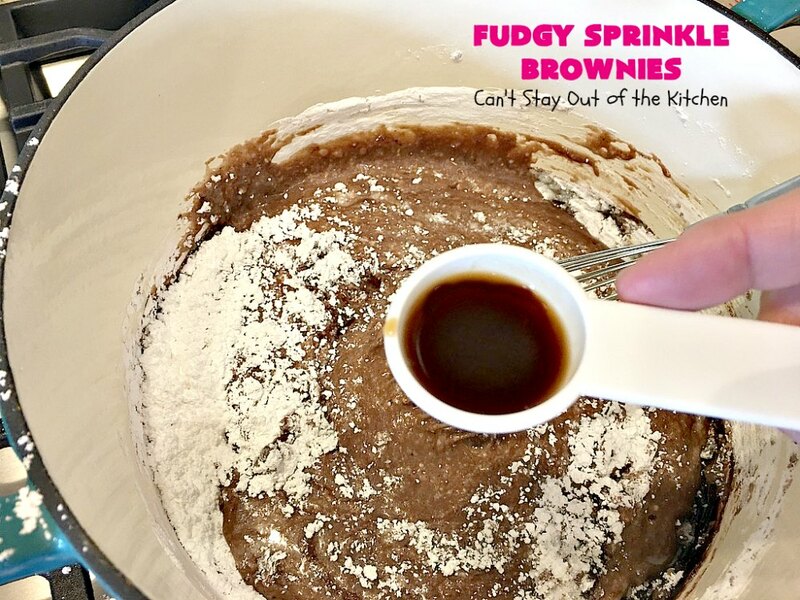 NOTE: My brownies took about 45-50 minutes to bake completely, but some ovens may bake this recipe more quickly. 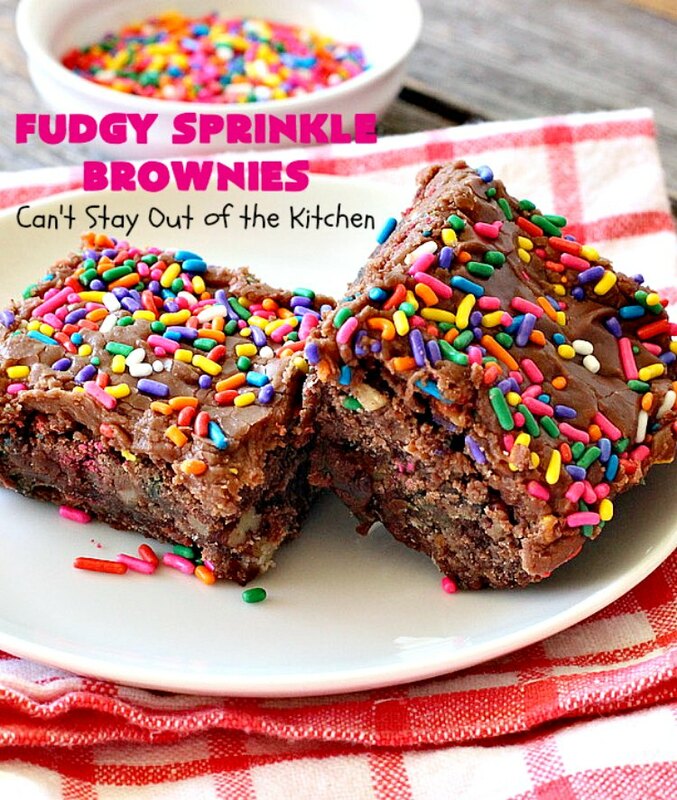 Chocolate lovers will love these fudgy brownies. Better try a bite while you still can!